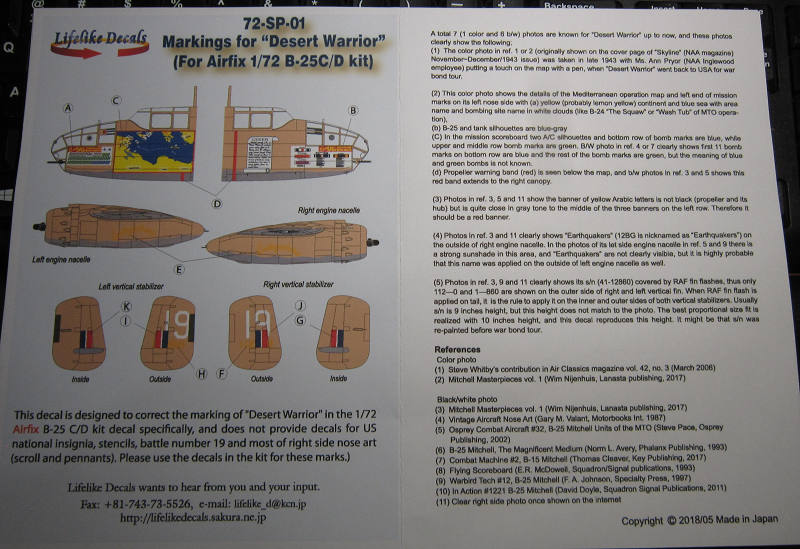 This decal is designed to correct the markings of "Desert Warrior" in the 1/72nd Scale Airfix B-25C/D kit. That decal specifically does not provide markings for the U.S. national insignia, stencils, battle number 19 and most of the right side nose art (scroll & pennants). Please use these. ​Lifelike Decals wants to hear from you and your input. Their FAX no., e-mail and web addresses are provided. Lifelike Decals is located in Sakura, Japan. This set comes in a zip-locked clear cello bag. It contains one small decal sheet and the instructions. The instructions consist of a single sheet folded in the center and printed on one side in color. ​On the left side of this sheet is color illustrations of both sides of the nose of the "Desert Warrior", its engine nacelles and rudders marks. 1. The color photo (originally shown on the cover page of "Skyline" (NAA magazine) November-December 1943 issue, was taken in late 1943, with Ms. Ann Pryer, putting a touch on the map with a pen, when "Desert Warrior" went back to the USA for a war bond tour. 2. The color photo showed the details of the Mediterranean operation map and left end of the mission marks on its left nose side with yellow (probably lemon yellow) continent and blue seas with area name and bombing site name in white clouds (like the B-24 "The Squaw" of MTO operation. B. B-25 and tank silhouettes are blue-grey. C. In the mission scoreboard two aircraft silhouettes and bottom row of bomb marks are blue, while upper and middle row bomb marks are green. Black and white photo clearly shows first 11 bomb marks on bottom row are blue and the rest of the bomb marks are green, but the meaning of blue and green bombs is not known. D. Propeller warning band (red) is seen below the map, and black and white photos show the red band extends to the right canopy. 3. Photos show the banner of yellow Arabic letters is not black. The propeller and its hub are. But is close to a grey tone to the middle of the three banners on the left row. Therefore it should be a red banner. 4. Photos clearly shows "Earthquakers" (12th Bomber Group is nicknamed as "Earthquakers") on the outside of the right engine nacelle. In photos of its left side engine nacelle there is a strong sunshade in this area, and "Earthquakers" are not clearly visible, but it is highly probable that this name was applied on the outside of left engine nacelle as well. 5. Photos clearly shows the serial no. 41-12860 covered by RAF fin flashes, thus only 112-0 and 1-860 are shown on the outer side of the right and left vertical fin. When RAF fin flash is applied to tail, it is the rule to apply it on the inner and outer sides of both vertical stabilizers. Usually the serial no. is 8" high, but this height does not match the photo. the best proportional size fit is realized with 10" height, and this decal reproduces this height. It might be that the serial no. was re-painted before the bond tour. 11 references are at the bottom of this sheet. Copyright of the set is 2018 and sheet was made in Japan.